I haven’t been posting much this year about my knitting, mostly because I’m working on some larger projects. Currently on the needles are two sweaters, a pair of socks, some fingerless mitts, and I just finished this shawl/wrap last week. I decided to make the large size of the pattern (over 66″ wingspan) and used a little more than three skeins of yarn. The Hazel Knits yarn is fantastically squishy, but still light and soft, so it’s not too bulky or heavy to wear. There’s also some subtle shifting in color in each, which adds a little more depth and richness to the stripes. The construction is quite clever, but not overly challenging, and was an easy knit to work on while in the car or watching tv. I’d like to make it again, but perhaps trying a variegated or hand-painted speckled yarn for a different effect. As always, full details can be seen on my Ravelry page. Nineteen pairs of socks (one not pictured), three pairs of mittens, and one scarf (also not pictured). Eventually I’ll take the time to figure out how many yards of yarn, but I’d venture a guess of around 10,000yds or so. Not too shabby. Looking forward to 2018 and a lot more knitting. 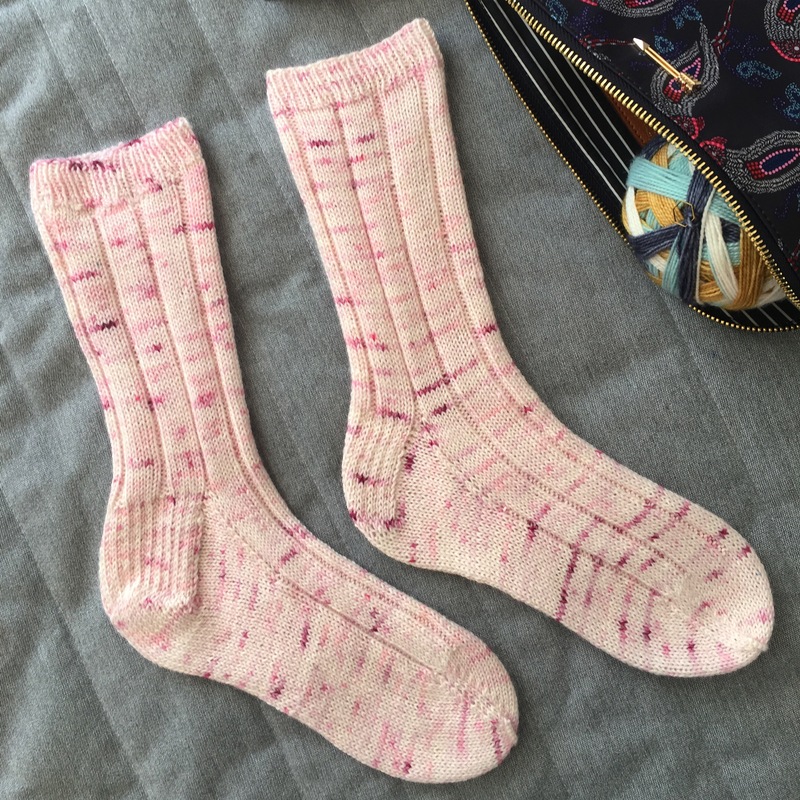 I decided to use up the leftover yarn from these and created my own pattern for a pair of short crew socks. I love my rollers, but these should stay on a little better when wearing shoes. 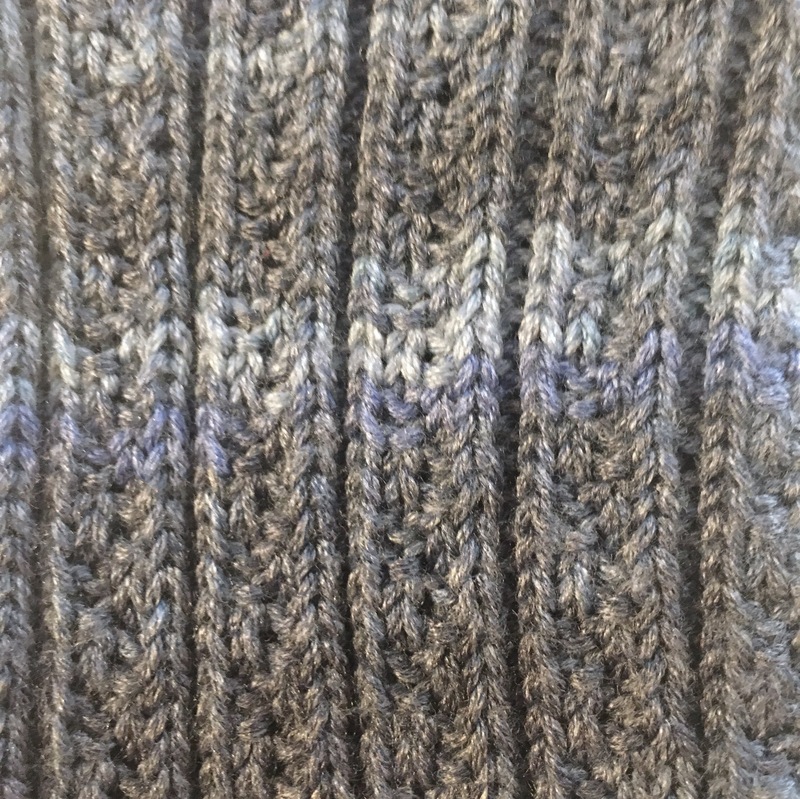 Basic construction of a 2×2 rib and heel flap, they flew off the needles and used up every last bit of yarn. You can read more about the yarn here and can find full project details on Ravelry. This year I was able to knit five different gifts this year. It was pretty much down to the wire, and I still need to finish a second sock for my brother and complete another gift, but I’m pretty happy with how many I was able to give this year. I made this pair of socks for my dad. For those that know my dad, he is not really a crazy colorful, striped sock guy, but the colors just reminded my so much of him and I wanted to make something special for him this year. Even if he just wears them around the house, it will make me happy. 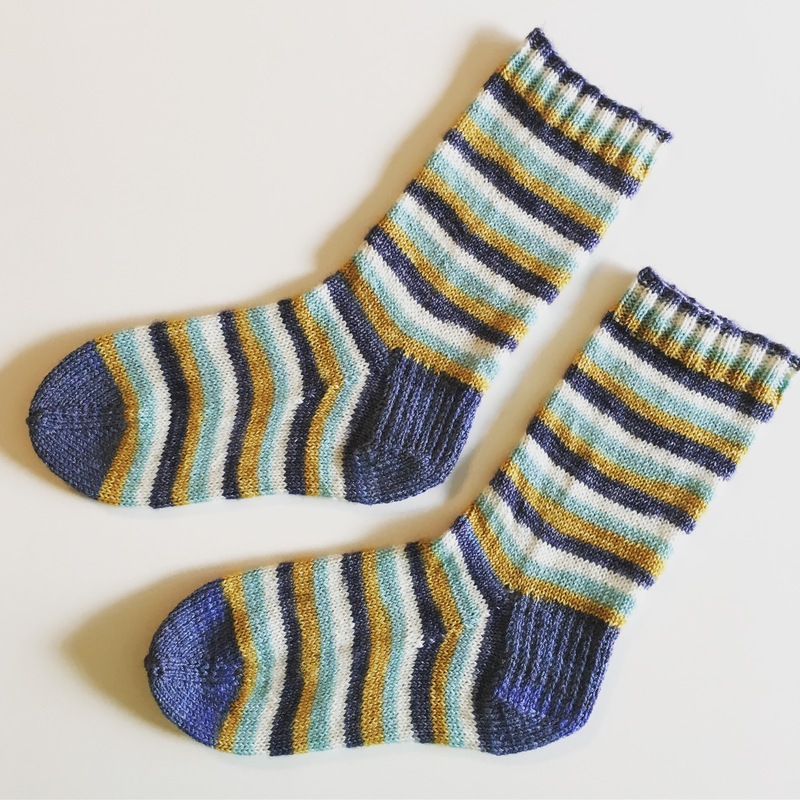 I used Nomadic Yarn’s self striping sock yarn in “Meet Me in Montauk” with contrast heel/toe in Hazel Knit’s Artisan Sock in “Zest”. I knitted this pair mittens for Joey’s kindergarten teacher. I used some wonderfully delicious Bello worsted yarn by The Plucky Knitter in “Weathered Plank” held double for the mitten and some ancient Bernat Multi Sox I had in my stash for the cuff. You might remember these from #operationsockdrawer back in June. My sister Ashley saw me working on them when we went to see my sister Rozalyn’s concert and she loved them so much I decided to put them aside to give them to her for Christmas. 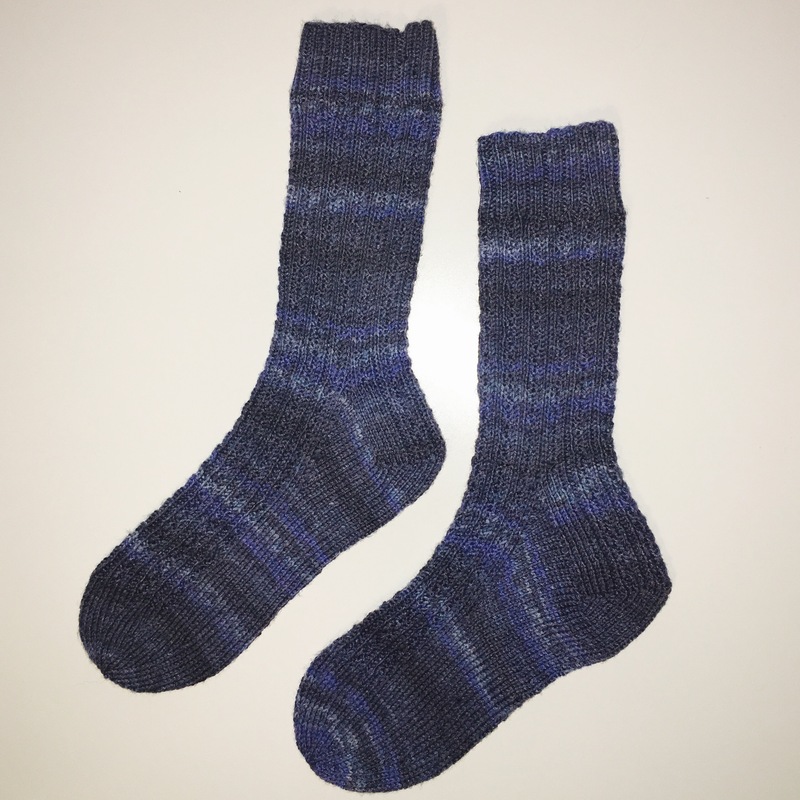 I also knit a pair of socks for my mom that I forgot to photograph. They nearly identical to this pair, but the the dye lot was different so it was a much lighter pink color. Overall, I’m quite pleased with the number of gifts I was able to make this year and hopefully I’ll be able to increase that number in 2018. As always, full project details can be found on my Ravelry page. Going down to the wire with the publishing . . . .November’s installment for #operationsockdrawer are languishing projects from earlier this year. This pattern is fantastic for using up those leftover bits and bobs of yarn from other projects and fly off the needles. Full details will be on Ravelry shortly. Most of this month’s knitting time has been devoted to secret Holiday knitting. More will be shared after they’ve been gifted! 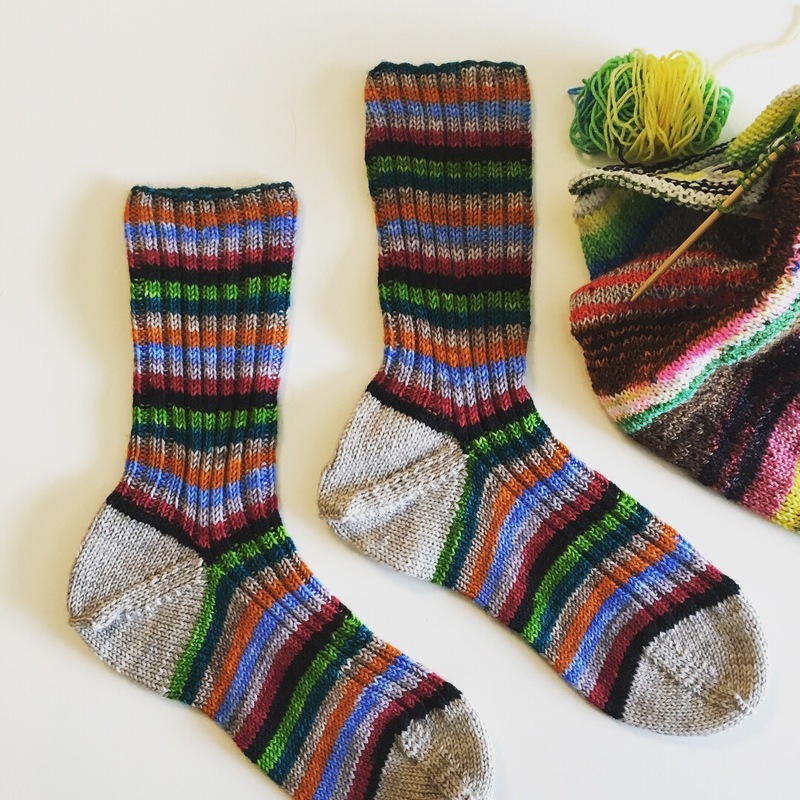 Only one more month left for #operationsockdrawer and I’m excited to cast on my final pair. October’s entry into #operationsockdrawer might be my new favorite pair. 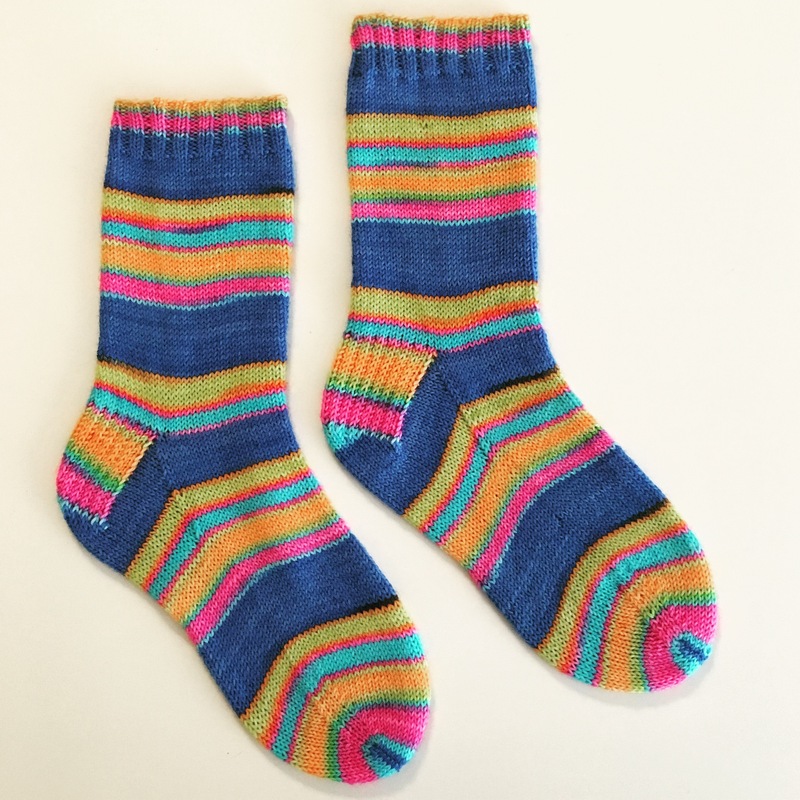 This amazing self-striping yarn is from Must Stash Yarns as part of her Beatlemania collection. Didn’t she capture the colors perfectly? I went with the simplest of designs so the yarn could really sing. (See what I did there?) Soft and squishy, I know they’ll be on repeat once the weather cooperates. As always, full details can be seen on Ravelry. September’s installment of #operationsockdrawer might be one of my favorites. The yarn is an exclusive colorway for Wool & Honey from ScrupticousPurl. The colors gorgeously recall summer on Lake Michigan; the sandy shore and inky water, the sky and clouds. So pretty! The yarn itself is so cozy and warm, I know that they’ll be in heavy rotation this fall. I used this ever-faithful pattern. Which I’ve memorized long ago. All the detail on Ravelry. I also finished another pair of Rollers. Such a great way to use up those leftovers and super quick to knit, they’re great to keep in the car to work on when waiting at school pick up or at music lessons. I’ve already cast on my third pair! August’s edition of #operationsockdrawer are all about the yarn. Woolberry Fiber Co. 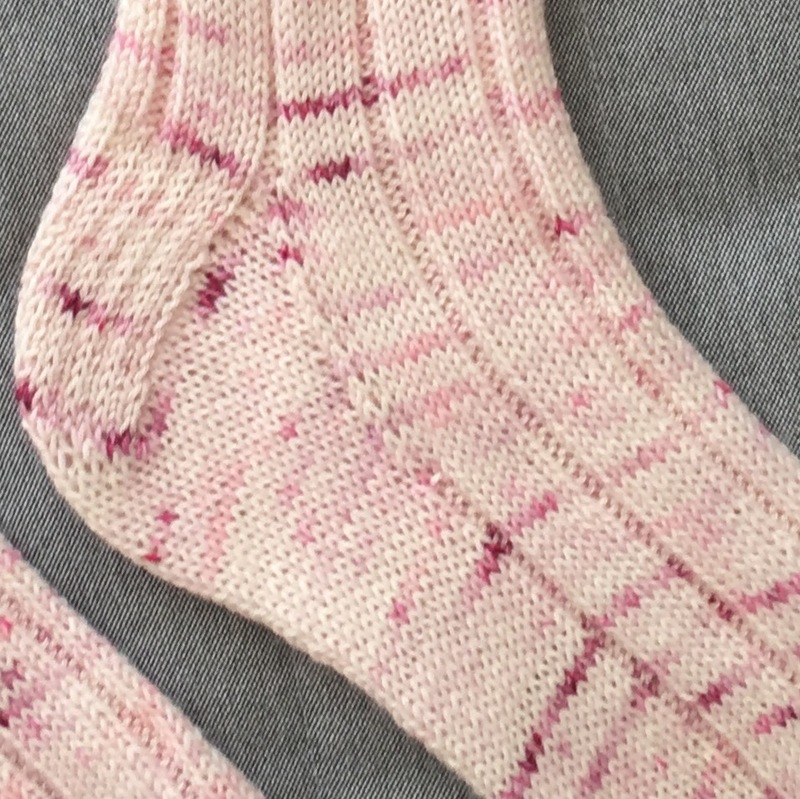 Simple Sock in the Painted Trillium is an exclusive colorway made for Wool & Honey’s Sleep Bear Yarn Club. The photo doesn’t do this hand painted yarn justice. Fades from creamy white to blush with flecks ranging from fushia to a deep berry, I wanted a simple pattern to let the colors sing. I chose Vanilla Latte Socks, a simple 6×2 rib that gave it just enough interest while still being mindless enough for watching TV or while waiting at Joe’s music lessons. July’s entry for #operationsockdrawer was technically done at the end of June, but I wasn’t able to finish washing and blocking them until after our vacation. This self-striping yarn is from Nomadic Yarns, an indie dyer on Etsy, and the colorway is “Anne with an E” – inspired by Anne of Green Gables. It was rather addicting to knit and was perfectly soft and cozy for socks. They’ll feel wonderful warm this fall. I had some Anzula Squishy leftover from this pair, and it was just enough for the contrasting heel/toe. It definitely added another level of coziness – I’m tempted to make an entire sweater using that gorgeously soft Anzula. Pattern was another mash-up of Silver’s Sock and Smooth Operater. As always, more details can been found on Ravelry. I started these socks on June 24, 2010. I completed them on June 25, 2017. During that times we’d moved around the Midwest, had a family, celebrated life, mourned losses, and generally had a busy, happy life. I finished the first sock fairly quickly, but hated the pattern and the yarn I was using. Banished to “second-sock island,” I would occasionally dig this project out and cast on the second sock, only to quickly stuff it away again and cast on something more pleasurable to knit. The yarn, Berroco Comfort Sock, was a poor choice. It’s a nylon/acrylic blend that felt dead in my fingers as I knit it. It was a rookie knitter mistake to buy it. It made a beautiful, soft and squishy, durable pair of socks but the process of knitting them was gross. So, the project languished on as half-finished until this Spring. Determined to clear out my last few forlorn UFOs (unfinished objects), I resigned myself to knitting the equivalent of going to the DMV: not pleasurable, seemingly lasts forever, but a feeling of great satisfaction when completed. These will not count towards #operationsockdrawer, instead I’ll be gifting these to my mom, she’ll love them and I won’t have to look at them again. More details can be found on Ravelry.